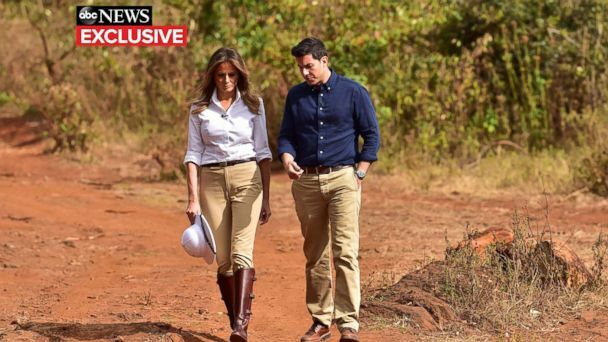 But when she sat down with ABC News for a rare interview during her recent trip through Africa, she spoke freely, describing times when she has disagreed with her husband as well as what she likes about her role - which she repeatedly emphasized she does, indeed, like. "I love Washington. I love to live there. And I made the White House home - for our son and my husband - and we love to live in the White House," Trump told ABC's Chief National Affairs Correspondent Tom Llamas. "We are very honored to serve our great nation," she added. "But it's also when I travel across the world and across the country, meeting people, and hearing and helping them as much as I can, and hearing what is important to them," she added. Nevermind that her husband has taken a vastly different approach when it comes to his views on a global community. Last month, he told the U.N. General Assembly, "We reject the ideology of globalism and embrace the doctrine of patriotism." And earlier this year, President Trump sparked backlash at home and abroad after reportedly calling certain African nations "s---hole countries" during a meeting with senators in the White House. The president later denied using that language. "Well, he was very charming and we had the great sparkle. He came with a date. So he asked me for the number and I said, 'I will not give you my number. So if you give me your numbers, I will call you.' So I see what kind of numbers he will give me. Because I don't want to be one of the ladies. And he was known as kind of a lady's man." "We have a great chemistry and to be with a man like my husband is you need to know who you are," Melania Trump told Walters during the campaign in a 2015 interview. "You need to have a very independent life and supporting him, you need to be very smart and quick, and be there for him when he needs you." Trump says she wants to make the most of these White House years. And yet, she says not everyone wants to help. The first lady lamented that organizations have spurned her efforts to collaborate, accusing them of allowing her husband's politics to get in the way of her charitable endeavors. "It's sad to see that organizations and foundations that I want to partner with choose not to because of the administration," the first lady said. "And I feel they're choosing the politics over helping others." Who exactly said no? Trump wouldn't specify, saying, "I would not talk about it. They know who they are. I don't want... I don't want to put them out in front of the world, but they know who they are." One incident, in particular, garnered an apology from her famously stubborn husband - the release of the Access Hollywood tape during the run-up to the 2016 election, in which Trump is heard making vulgar comments about women. "During the Access Hollywood incident during the campaign, your husband apologized to you. Has your husband apologized to you since you've been in the White House?" Llamas asked the first lady. "Yeah, he apologized," she said, before declining to divulge further details. Six days after her interview with Llamas, the first lady's staff clarified her comments, telling ABC News, "The president often apologizes to Mrs. Trump for all the media nonsense and scrutiny she has been under since entering the White House." Asked if her husband's alleged affairs - which the White House has denied - have put a strain on their marriage, she said that people and the media like to speculate and circulate gossip. "I'm a mother and a first lady, and I have much more important things to think about and to do," she told ABC News. "It is not a concern and focus of mine." Speaking to ABC News in Africa, she addressed the #MeToo movement, calling on sexual assault accusers to present "really hard evidence" if they decide to go public with allegations. "I support the women - they need to be heard. We need to support them. And also men, not just women," Trump said. "You cannot just say to somebody... 'I was sexually assaulted' or 'You did that to me.' Because sometimes the media goes too far and the way they portray some stories, it's not correct. It's not right." Still, the first lady presses on. She spoke of her son, Barron, who is now 12 and whom she keeps shielded from the spotlight. After the inauguration, she stayed with him in New York until he finished the school year. She said she doesn't always go to his sports practices and games because it would "bring the attention." "I don't go much," she said. "He likes to be one of the boys when they play. ... It's his life too, and I respect that." During her time in Africa, Trump sought to highlight her major policy initiative, "Be Best," which raises awareness about the effects of online bullying on children, among other things. The first lady explained how her experience being bullied led in part to her "Be Best" initiative, going so far as to suggest she is one of the most bullied people in the world. Both online and on TV, people often focus on what Trump wears. Sometimes it's because of appearances at glamorous diplomatic or ceremonial events in the White House or abroad. Boarding a plane to Texas to meet with children of families separated at the border, Trump was spotted donning a green jacket with the words, "I really don't care, do you?" emblazoned on the back. Her choice of wardrobe caused backlash before her flight landed just hours later, with her concern for those children of separated families immediately being called into question. After her team initially denied any subtext in the jacket's words, the first lady told Llamas that wearing that jacket was, in fact, a deliberate choice, meant "for the people and for the left-wing media who are criticizing me. I want to show them that I don't care. You could criticize whatever you want to say, but it will not stop me to do what I feel is right." "It was kind of a message, yes. I would prefer that they would focus on what I do and on my initiatives than what I wear," she said. Asked about suggestions that the jacket's message was directed at the children of separated families. "It's obvious I didn't wear the jacket for the children," she said. "I wore the jacket to go on the plane and off the plane. ... After the visit, I put it back on because I see how [the] media got obsessed about it." In spite of her appreciation for the nation's capital, she doesn't trust everyone who works for her husband there. Trump told ABC News some of the people in the president's administration whom she didn't trust have left, while others still work there. Despite all this, Trump said she hasn't changed since uprooting her life in New York City and moving to the nation's capital. "I'm staying true to myself. I want to live [a] meaningful life, and that's the most important to me. I know what my priorities are, and I'm focused on that," she said. Trump says she has the same close group of friends she had before coming to Washington. "I always prefer quality over quantity," she said. Asked if it's hard to make friends in Washington, the first lady said, "Sometimes; you need to be careful." "You know, our first first lady, Martha Washington, famously said the role of first lady can sometimes feel like a state prisoner. Can you relate to that?" asked Llamas. "I don't feel like a prisoner. No. I [am] enjoying it, and this will not last forever. And it's [a] very special time," she said. Some of the biggest misconceptions about her, she said, have been what she called the "speculations" - that she's "out of touch," or doesn't live in the White House, or rumors that spread after she spent time in the hospital for a benign kidney condition, as her spokeswoman reported. "Speculation, speculations," Trump said, "and my office put out the statement, a factual statement, and people still didn't believe it."